It’s been about a month since I posted anything. I’m assuming that everyone by now has already heard about the tragic earthquake in Haiti (Ayiti). First off please keep the people of Haiti in your thoughts and support a charity of your choice that you know can best help the people affected. I personally recommend Yele Haiti. Text ‘Yele‘ to 501501 to donate $5 or Text ‘Haiti‘ to 501501 to donate $10. I’m a first-generation Haitian American who has never been to Haiti. Sadly my family (me, my parents and siblings) were never able to find the time or resources to make the trip while it was safe to go. But with such a big Haitian-born family I got to know my heritage very well. I say all this to point out that I know a lot about whats great about the country and the people. Haiti is so much more then what is shown by the media even now. 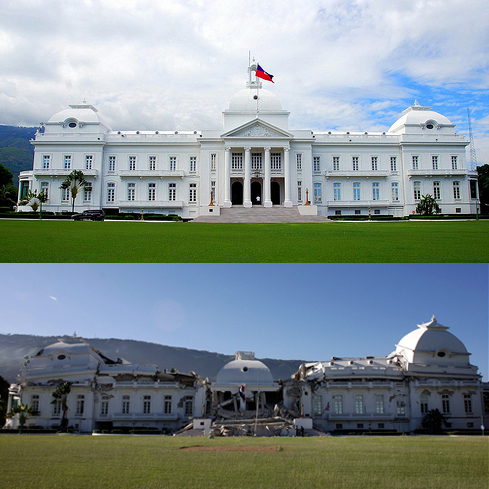 Above is a before and after picture of the Haitian Palace which pretty much symbolizes the state of Haiti today. Most people in the US only see tragic images of Haiti. Mostly focusing on the poor & hungry, then there’s what seems to be constant coup d’etat coverage. While Haiti does suffer from a lot of those issues, the media never seems to ask the question why. They only seem to focus on talking points… “Haiti is the poorest country in the western hemisphere…”. Haiti became the first african-led republic in the world after a successful slave rebellion in 1804 against France. The name Haiti (Ayiti) was chosen to honor one of the indigenous Taíno names for the island which meant land of high mountains. You can imagine how the ‘super powers’ in the world felt after Haiti not only became free from slavery but an independent nation. France really wasn’t cool with that setup. In July 1825, during a vulnerable time, France came back with troops and forced the Haitian president Jean Pierre Boyer to sign an indemnity stating that in return for 150 million francs (modern equivalent of $21 billion) paid within five years, France would recognize Haiti as an independent country. This was just the start of the crushing debt that Haiti owes the wealthy nations of the world just to be free. After that many nations pimped the Haitian government. There were many coups. From 1911 to 1915 there were six different Presidents of Haiti, each of whom was killed or forced into exile. The US at the time was worried about a group of wealthy Germans who had huge influence is Haiti’s international commerce. The American government decided to act quickly to preserve their economic dominance over Haiti. The United States occupation of Haiti began on July 28, 1915. After the great depression the US was done with Haiti. Franklin Roosevelt removed troops and left the country powerless. Potential war with the Dominican Republic and more coups kept Haiti in its poor state. Once Papa Doc took over it was a wrap. Between him and his successor Bébé Doc, Haiti fell into much more debt. Both dictators were supported by loans from the worlds wealthy banks who knew exactly where the money was going. As long as they didn’t go communist it was all good. 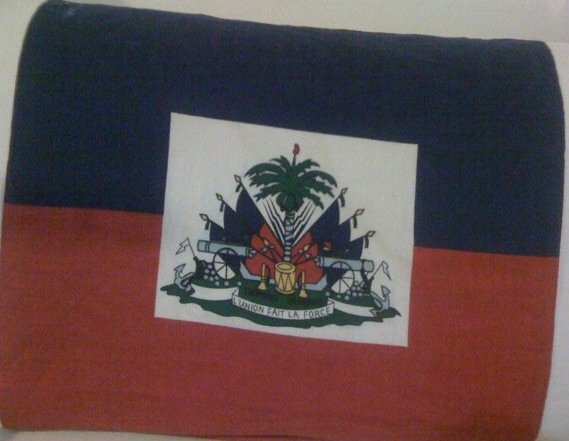 Despite such an oppressive history Haitians remain strong. The national motto written on the flag in french means strength through unity… L’union fait la force. As terrible as this earthquake and the previous natural disasters were, I hope nothing but good comes from this exposure. But I keep hearing and seeing the same crap. The worst is pictures of hundreds of armed troops landing in Haiti. Historically that has never been a good sign. What else can the world take from Haiti? Most of the citizens of the world want to help and trust their governments to do the right thing… but we all know how that usually goes. As soon as the public loses interest… Haiti may fall back into the hidden oppression it has suffered for far too long. And the media will pick up where it left off… “…another coup in the poorest nation in the western hemisphere”. I’ll continue to share more about my mother’s land in the hopes that people will read and learn more about Ayiti. I’m working with my parents to continue supporting family still in Haiti as well as supporting the Yele Haiti movement. Hopefully in the near future I’ll take my long overdue trip to Ayiti with my new family (Wife and kids). Invest in some land and keep the ties to my roots going…. hopefully.